Teaser for Akshay Kumar’s Gold Out Now! The first teaser trailer for the Reema Kagti directorial GOLD, starring Akshay Kumar, is out and it gets you ready for the release of the film on Independence Day, 15th August 2018. With the clip lasting just over one minute, audiences caught a glimpse of what they can expect from the Ritesh Sidhwani and Farhan Akhtar Excel Entertainment production. Bringing alive the glorious history of Independent India’s first Gold Medal at the Olympic Games held in London 1948, the actor plays a fiery fictional Bengali character, Tapan Das, who has a burning infatuation for his country and the sport of hockey. 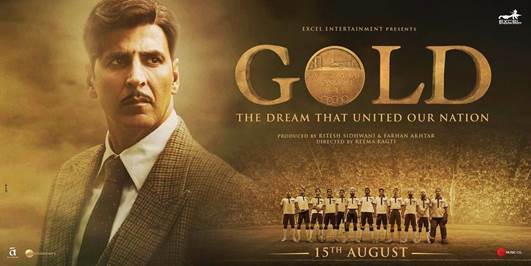 GOLD releases worldwide on 15th August 2018.